THE evangelical counsels – the vows of poverty, chastity and obedience – have been the subject of a weekly class throughout our time here in Hong Kong and they will continue right up until the conclusion of our novitiate. It is obviously essential that we have a clear understanding of what these vows entail as – should we persevere and be further accepted by the order – we will have to live them. I have decided to dedicate this entire letter to an examination of chastity and priestly celibacy, as they are the things that I was most often asked about whenever people learnt that I was to enter the novitiate for the Order of Preachers. No one ever asked, “Won’t you miss money?”, or “What if they send you to Papua New Guinea?”, but scores of people asked all manner of questions related to chastity and priestly celibacy. Many of those questions also showed that we have a long way to go in explaining the beauty, necessity and significance of this particular aspect of priestly and religious life. It is thus not particular to religious or priests, though clearly there is a difference in intentionality between someone who swears vows of perpetual chastity in a religious community and someone who lives a chaste life of fidelity within a Christian marriage. Nonetheless, chastity is essentially a call upon all the baptised. Consecrated celibacy, however, is not – not all Christians are called to live a celibate life. If they were, after a time, there would be precious few Christians in the world. It is particular to the priesthood and religious life. It is a free choice made by the person so called for the Kingdom of God. It is inseparable from the vocational call itself. Yet we seem to have lost the sense that people are truly “called” by God, that Christ does actually say, “Follow me” (Matthew 4:19; Mark 1:17). The implication being – horrifyingly enough – that the priesthood is for those sad cases unfortunate enough not to find a woman willing to marry them – as though the priesthood were the vocation of last resort; the one you “choose” if you were not able to “get” the one you really wanted. Without a belief that God calls people to particular states of life, very little about the priesthood or religious life will make sense: celibacy, in particular, will be incomprehensible. Yet all becomes clear in the context of a call – and a response. From personal experience I can attest to the fact that, once God lays a Hand upon you, there is never any real question of you desiring to shake it off. There is no question of your desiring to turn your back once your hand has been placed on the plough. The vocational call, the insight – however briefly granted, however dim – into the plan that God has for our lives is not something that should be taken lightly. It is truly a pearl beyond price – once glimpsed, a person thinks nothing of selling or surrendering all they have to obtain it. In the context of a call from God, celibacy can be seen more clearly for what it truly is. It is not at base a renunciation of marriage – it is ultimately and essentially a fulfilment of a vocation, of a life. If, as I believe, God has called me to the priesthood within the Dominican order, then for me to do anything else would be to leave my life a song half-sung, or one performed off-key. Religious celibacy is embraced by those called by God for a religious, an evangelical, motive – it is not chosen out of necessity, misfortune or coercion. It is to be viewed and understood as a commitment made by someone who has glimpsed in Christ the beauty that was, is and will be. It is a commitment to the Kingdom of God. It is a radical commitment to the will of the Father. It is a commitment to prayer, service, work and brotherhood but ultimately – and principally – to God. I must also add that this commitment is principally one of hope. I have heard many a priest propound a notion of celibacy which would accord with much of what I have already written, but it lacked what I regard as the essential element – the theological virtue that is hope. If celibacy were understood and justified primarily by the manner in which it frees me up to be of greater service to a greater number of people, we would be skating on terribly thin – and rather utilitarian – ice. We would be in danger of seeing celibacy essentially as a means to an end – greater service. There is no doubt that the priesthood and religious life are calls to service, and that a service of love. Yet if celibacy were conceived purely in this way, we would be trapped into concluding that the lives of priests and religious are to be assessed principally by how much they do, how many people they serve, how busy they are. Ultimately – and inevitably – such a conception would lead to disappointment, dejection and possibly even depression on the part of those called to live this life. If celibacy were justified purely as a means to an end, rather than a positive end in itself, it would be useful but theologically bankrupt. Consecrated celibacy is – must be – a good in and of itself. It epitomises the virtue of hope – hope in the Kingdom to come, hope in the life to come, hope in the Redeemer who will come again. It is the ultimate sign of a radical Christian hopefulness: a sign of God’s eternity which is even now, today, breaking through the clouds. I may never have children, but I will take part – and a very active part, I might add – in the work of eternal regeneration, in the remaking of all things new in Christ. We are all called to be generative – it is simply that the life to which God has called me entails spiritual rather than biological generation. Catholic priests are called “Father” for a reason. This virtue of hope needs, I believe, to be revived in more ways than one. I’m sure they meant well, in a depressing, hopeless sort of way. Like saying to a man about to start a marathon, “We’ll be here with the oranges if you trip and break a leg.” Very encouraging. Can you imagine saying to a man or woman who is about to get married, “Look, if it doesn’t work out, if you don’t like it, you may as well throw in the towel.” No! Of course not! It would be an expression of a dreadful lack of confidence in that person, as well as in marriage. So what does it say when we repeat those or similar words to people aspiring to the priesthood or religious life? What does it say about our faith and confidence in God? Why, ultimately, do we seem to be planning for failure? Instead of being so glum, instead of stomping on the nascent vocational aspirations of others, perhaps we would be better off encouraging them. 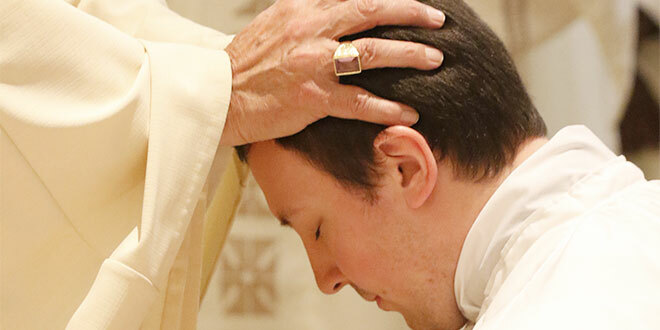 I can think of several specific instances in my life when someone – perhaps prompted by the Holy Spirit – asked me, “Are you going to be a priest?” Let us once more begin to ask that question, and to ask it with hope, with joy. After all, we are supposed to be an expectant people, waiting in “blessed hope” as we pray at every Mass. A life of hope does not baulk at the first hurdle. St Gregory of Nyssa once wrote that Christians – in so far as it concerns the course of virtue pursued by their brothers and sisters in Christ – should live as a people “leaning forward” from the grandstand – that we should be enthusiastically cheering one another on, flailing the air with our outstretched hands as we spur each other on in the pursuit of our heavenly calling, our divine vocation. Perhaps we need to rekindle our sense of the adventure that is the life of faith – the race truly worth running, and one in which we ought to be fervently encouraging our fellow runners to be fleet of foot and sure of step. A response to any vocational call, whatever it may be, ought to be honest, generous and sincere – and realistic. I have never heard anyone claim that a life of consecrated chastity is easy, and I am yet to encounter anyone who is of the firm opinion that marriage is an unremittingly pleasant walk through a butterfly park. Celibacy, like marriage, is a triple jump into the unknown, but, as with all vocations, it is ultimately an expression of faith and hope and love. If we are called to leap, then for us to do anything less would demonstrate a severe lack of faith, of hope and of love.Ultimately, even, a lack of a spirit of adventure. After all, the route for our pilgrimage of faith upon this earth is marked out, not by us, but by God. That is what makes it so interesting. Our Heavenly Father has called me to a life of service and a unique expression of the hope of things to come. I, by the grace of God and with the support of fraternal communion, fully intend to live it joyfully as we all await the blessed hope and the coming of our Saviour, Jesus Christ. What will be discussed at Australia’s plenary council?